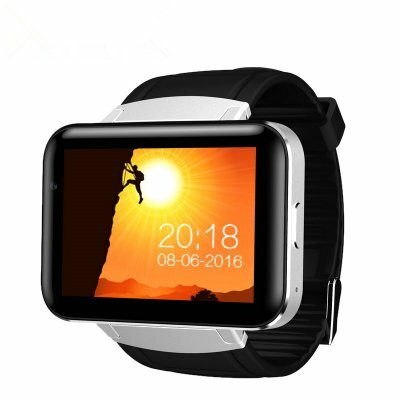 Successfully Added DM98 3G Smart Watch Phone - Android 4.4 MTK6572 Quad Core 1.2GHz 512MB/4GB Bluetooth WiFi GPS Google Now 900mAh B (Silver) to your Shopping Cart. Take your connectivity to the next level with the DM98 smart watch phone. This remarkable phone watch is so much more than a regular Bluetooth watch. Thanks to its Android operating system, it lets you enjoy all the regular smartphone features straight from your wrist. It treats you to 4GB of storage, meaning that you can download Apps, games, and movies straight from the Play Store. It even comes with an intergraded 1.3MP camera. This snapper lets you take nice pictures and video of all those upcoming special moments in life. By featuring an intergraded microphone and speaker, this phone watch allows you to make calls without needing to have your smartphone at hand. It can hold 1 SIM card and supports 1 IMEI number thanks to which it can function entirely on its own. From now on, you’ll no longer have to carry along your iOS or Android phone in order to stay connected to friends or family. With its 900mAy battery, it brings along up to 6 hours of continuous talk time. Besides supporting calls and text messages, the DM98 smart watch phone also lets you browse the web. This has been made possible by its 3G and WiFi support. Thanks to this, you’ll be able to access the internet to stream or download files at any given moment. Naturally, this Bluetooth watch can also be paired with your smartphone via the dedicated mobile Application. Besides offering you great connectivity, it treats you to an abundance of smart health and fitness features that guide you in working towards a healthier future. The DM98 smart phone watch comes with a 12 months warranty, brought to you by the leader in electronic devices as well as wholesale watch phones..